Under Abe, are we heading toward a beautiful Japan or an ugly future? “Toward a Beautiful Country” is the title of the book the current prime minister, Shinzo Abe, wrote in 2006 (revised in 2013), so my choice of phrasing was deliberate, juxtaposing ethereal Japan with Abe’s dark space. His reactionary vision for the future is caught in a pre-1945 time warp, drawing on the values that prevailed in Imperial Japan that are out of touch with contemporary Japan. There is nothing beautiful or inspiring about his glowering ideological agenda. Like many other Japanese politicians, Abe’s seat in the Diet, and political views, are inherited. His father, Shintaro Abe, was foreign minister (1982-87) under one of Japan’s most hawkish premiers, Yasuhiro Nakasone, and his grandfather was Prime Minister Nobusuke Kishi (1957-1960). Kishi took the reins of power in a backroom deal in the recently established Liberal Democratic Party following the merger of two conservative parties in 1955 that the CIA helped fund into the 1970s. Kishi had been released from jail in 1948, a Class A war crimes suspect, but in one of Japan’s most remarkable political comebacks, less than a decade later he was leading Japan, head of a party that Japan’s wartime adversary helped create. Kishi was on the list of Class A war crimes suspects drawn up by the U.S., but never prosecuted, for his role as Prime Minister Hideki Tojo’s minister of munitions, having signed the declaration of war that resulted in the 1941 attack on Pearl Harbor and been implicated in the coercive recruitment of slave labor in wartime Manchuria. On that score, it is safe to say that Abe meets his own litmus test for leadership, since almost all his signature polices have attracted lukewarm support at best. For example, his 2015 legislation allowing Japan to exercise the right of collective self-defense remains deeply unpopular because the public worries that Washington will drag Tokyo into some conflict that has little to do with Japan’s interests or survival. 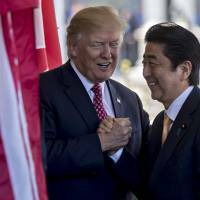 By acting as the Pentagon’s man in Japan and delivering much more on longstanding demands than all of his predecessors combined, Abe is shifting Japan incrementally but steadily toward a beefed-up military role, shredding constitutional constraints along the way. 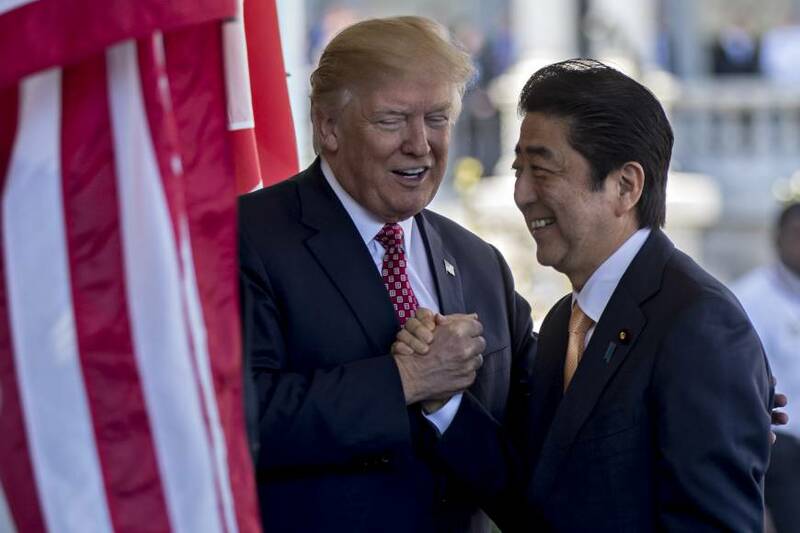 Examples of this salami-slicing strategy include the 2015 U.S.-Japan Defense Guidelines, which expand what Tokyo has committed to do militarily in support of the U.S., and the recent dispatch of a $1 billion helicopter carrier — Japan’s largest vessel — for a three-month regional tour that will culminate with joint naval exercises with India and the U.S. in the Indian Ocean. Projecting power is the new normal. Commenting on Japan’s evolving security posture a few years ago, Kenneth Pyle, professor emeritus at the University of Washington, described Japan’s post-1945 policy as the “eight noes”: no overseas deployments, no exercise of collective self-defense, no power projection capability, no nuclear arms, no arms exports, no sharing defense technology, no military spending above 1 percent of GDP and no military use of space. Except for the nuclear option, Pyle said, now the noes are all gone. It is also not beautiful that kindergartners at the notorious Moritomo Gakuen — which Abe and his wife once supported, until it became politically damaging — were cajoled into flag-waving patriotic displays and taught racial slurs targeting ethnic Chinese and Koreans. Moreover, Abe reacted very slowly to escalating and organized hate speech against Zainichi (ethnic Korean residents of Japan), finally enacting a toothless law last year banning it. Despite showboating on womenomics, Abe has not delivered. He gives nice speeches, and sets lofty targets — such as women constituting 30 percent of all managers by 2020 — but doesn’t follow through. He has shown an embarrassing lack of progress on empowering women in the labor force, where the gender wage gap remains wide and career ambitions are too often thwarted. Where is the beauty in diplomatic chicanery over the “comfort women” issue, muzzling the media, promoting patriotic education, rolling back transparency with special state-secrets legislation, restarting nuclear reactors and signing a nuclear technology transfer deal with India that does not specify nuclear testing as a condition for terminating the agreement? A word to the wise: Don’t start bemoaning Abe’s agenda at any gatherings or you could end up on the wrong side of Abe’s new conspiracy law, one that fails to appreciate the beauty in freedom of expression.